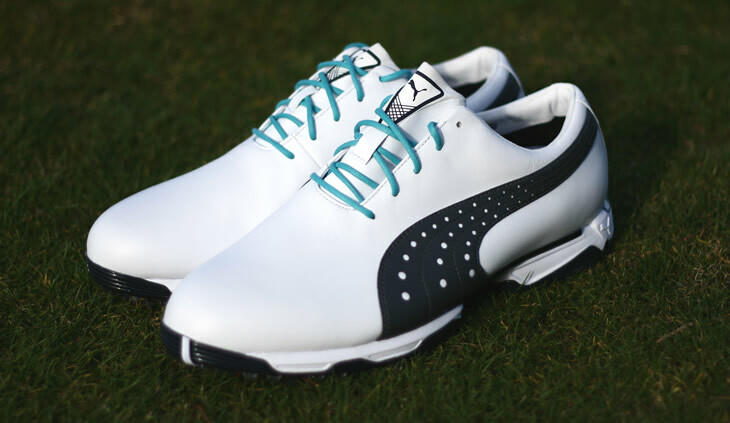 The Puma Neo Lux shoes are part of Puma Golf's new SportLux range that is designed to offer a more sophisticated, tailored range of clothing and shoes for 2014. The Neo Lux comes in either white or black and I got my hands on a pair of white Neo Lux's and wore them over the course of a few recent rounds. The second you see the shoes and hold them in your hands, you get an idea of what Puma designed them for. This is a high-quality, premium, traditional golf shoe. Puma have a wide range of lightweight and spikeless models, notably their Biofusion shoes, but the Neo Lux combines the highest levels of looks, stability and traction. The Puma branded wave on the side of the shoe sits atop a full-grain leather upper design that is smooth and gives the shoe its sophisticated look. 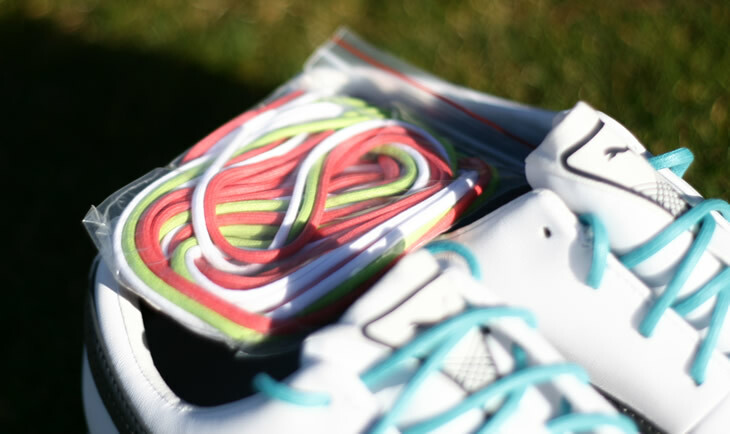 Whilst it only comes in two colours, the Neo Lux comes with four different-coloured laces. I got the option of white, orange, lime-green or baby blue. As you can see, I was drawn to the baby blue. Having worn the Puma Neo Classic ProType shoes before I know that Puma shoes can be a little large for a given size. I went for half-a-size smaller than my normal shoe size and they fit perfectly, so bear that in mind if you are ordering a pair of Neo Lux shoes without trying them on first. Often with this type of tailored, premium shoe the heel portion of the shoe can be uncomfortable to begin with and require the shoe to be broken in over the course of a few rounds. The Neo Lux however were surprisingly comfortable in the heel, likely due to the new slow-recovery Everfoam material they used. I have large, wide feet and often get blisters on my heel wearing shoes out of the box, however this new foam heel section prevented that. I really liked the style and looks of the previous Neo Classic ProType, but I found them slightly heavy and bulky. However it seems Puma have addressed that in the Neo Lux. Whilst 400 grams for a shoe may not sound light, that is actually remarkably light for a premium, high-traction shoe like this. I could really feel the benefit late in my rounds, as my feet didn't ache or feel tired like they can in a heavier shoe. Many people now value the weight of their golf shoe more than before. The influx of street or spikeless shoes has made more traditional golf shoes feel heavy and a little cumbersome during a round. However, spikeless shoes don't offer the same levels of stability or traction. It seems companies fight to balance stability with comfort and weight. However, the Neo Lux shoes struck an impressive balance between stability and traction versus lightweight flexibility. 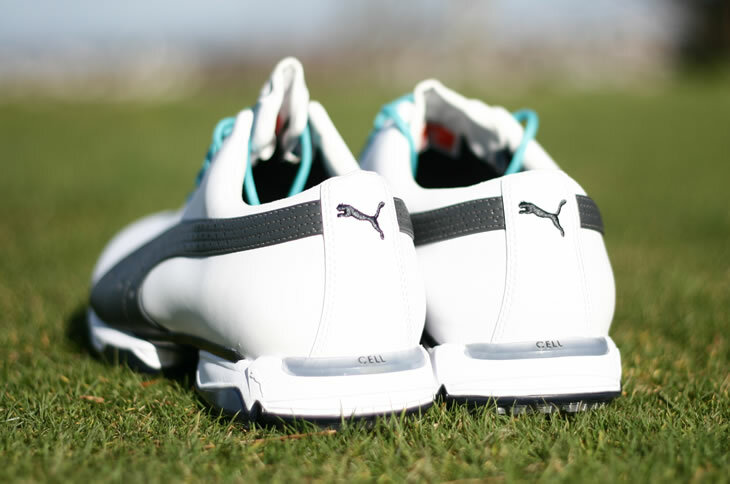 The shoes feature a Compression Molded midsole with Puma's IdCELL design which Puma say adds a more cushioned feel. I thought they felt soft yet stable on my feet, much like a well-fitted running shoe, with the addition of a high-traction outsole. The sole itself is full of angles, edges and spikes designed to keep you stable during your swing, whilst keeping you closer to the ground. 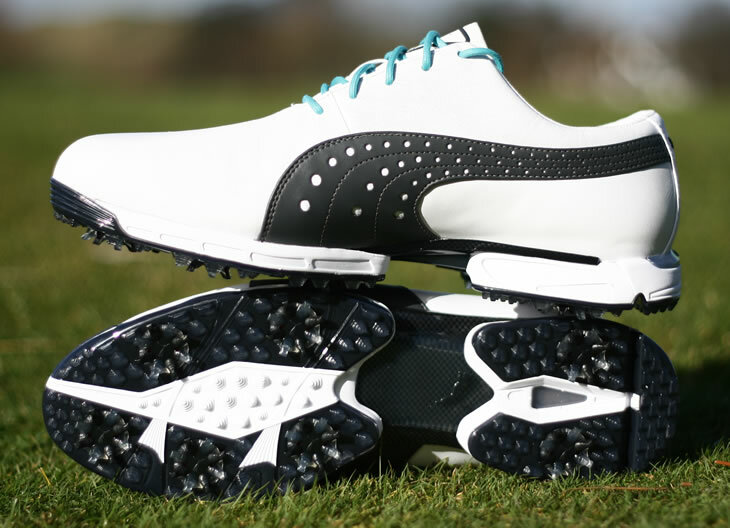 Puma's new Swing Speed Quill replaceable spikes allowed the R&D team to design the outsole in order to have your feet sit 32% closer to the ground. This change, along with the ArchTech (mid-foot gap) on the sole, made the Neo Lux feel surprisingly flexible and comfortable. If I was on a side hill lie, or just walking up or down hill, the shoe felt snug and flexible, more so than the Neo Classic Protype. One of my concerns with traditional leather golf shoes is wear. Too often in the past, I've paid a lot of money for golf shoes that have looked great our the box, then quickly become worn and wrinkled, especially near the toe. Whilst I haven't finished a season in the Neo Lux shoes, here is how they looked after three rounds, which I thought was pretty impressive. All they needed was a quick wipe with a wet towel to look near-new again. Overall, I was left impressed. Puma have always made eye-catching, good looking shoes, but I was keen to see whether they would address comfort and flexibility and they did. At around £150 a pair, they certainly sit in the upper-tier of the market, but rightfully so. 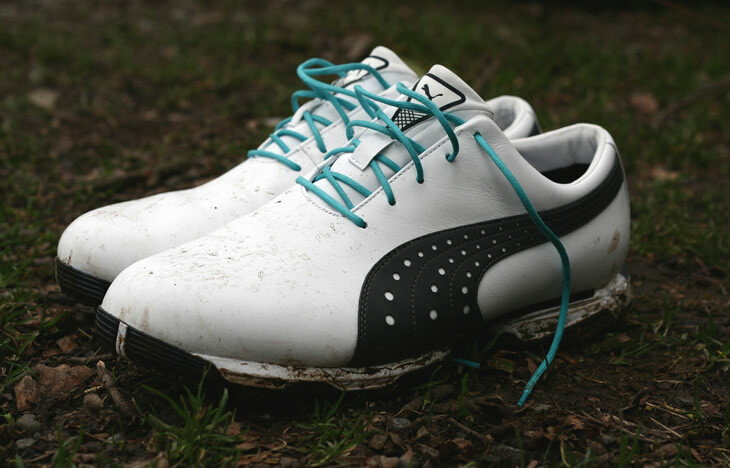 If you are in the market for a high-quality, high-traction, stable golf shoe, don't judge these shoes by their appearance, they are far more than just good looking.